Bed bugs are hitchhikers!! Renters, guests and friends coming and going at the cottage can bring unwanted pest problems. Good inspections are important. It’s important to know what to look for! What do Bed bugs look like? Where do they hide? Taking the time to learn a little bit can save you a lot of expense and grief later on. An adult bed bug is about the size of an appleseed, and is often found on or near beds in mattress seams, bed frames, cracks and crevices. 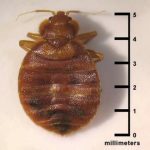 Are we seeing more bed bug infestations in Muskoka? There are a number of reasons why this is so. I read an article recently stating that due to global warming and climate change that pest activity is inevitably going to increase in areas where warmer temperatures are staying longer. We have seen this with milder winters and other climate change and weather phenomenon. This is certainly going to affect many pest issues such as Mice, who will have less mortality with more suitable conditions. Ants and other insects will emerge earlier and perhaps remain longer in the season. There will also be increased activity and evidence of all of these pests throughout the season. It may even lead to pests that were previously unable to survive our harsh winters to become a problem here. Pest problems such as Bed bugs are increasing for different reasons. Bed Bugs are hitchhikers. 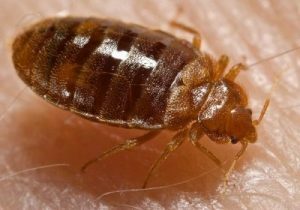 As more people move to and visit Muskoka, bed bugs are often unsuspectingly introduced. Many Muskokans travel as well. The potential to bring them home is a real possibility. Bed bugs are not just a problem for low income housing and so called “dirty people”. You can have a very clean home and do everything right and still have bed bugs introduced. The key is knowledge. You need to be aware of bed bugs every time you travel, have guests, or bring something into your home. 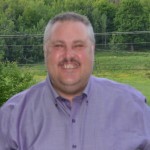 If you have a concern with Bedbugs, let the experts at Muskoka Pest Control help!